We made it! The final mileage turned out to be 376 miles, apparently we saved a few miles by riding through the City of Tuscon and taking Highway 84 through Eloy. This morning went really smooth it was nice to hang out with Anthony “Sarge” Herriage who helped with logistics during the Arizona Trail Hike. We made it out on the road by 8:30 am and had a really smooth day. No flat tires and nice road until we hit a huge mountain just outside of Yuma. It dropped us down to our slowest speed of 7 mph. Our descent however brought us up to a whopping 35 mph. Our final finish time was about 2:15 pm. At the boarder we were meet by two news stations and a newspaper journalist from Yuma. The entire experience was incredible; the thing I really appreciated about this ride was the time I had in my own head. Self analyzation really helps you clarify what the important things in life are; for me first and foremost comes my family. I would never be able to experience these types of adventures without my families support. I want to give a serious thank you to my team Scot “Scoob” Schmidt (El Capitan), Benjamin Cane (Logistical Engineer), & Gene Longwell (Support Rider/Traffic Cop). These guys were awesome; their positive and comical approach to life made the ride a blast. Also a special thank you to the Foundation for Blind Children for changing my perspective on blindness and enriching the lives of so many visually impaired and blind in Arizona. Tobin Ernst was like a 5th member of the team, and I’ve got to give him a thumbs up for all his hard work. I received incredible support from the following hotels and bike shops. An extra special thanks goes out to Doug Bowden; Doug was supposed to be part of our team but due to an unfortunate injury while participating in a charity ride with Tour de France he was unable to join us. 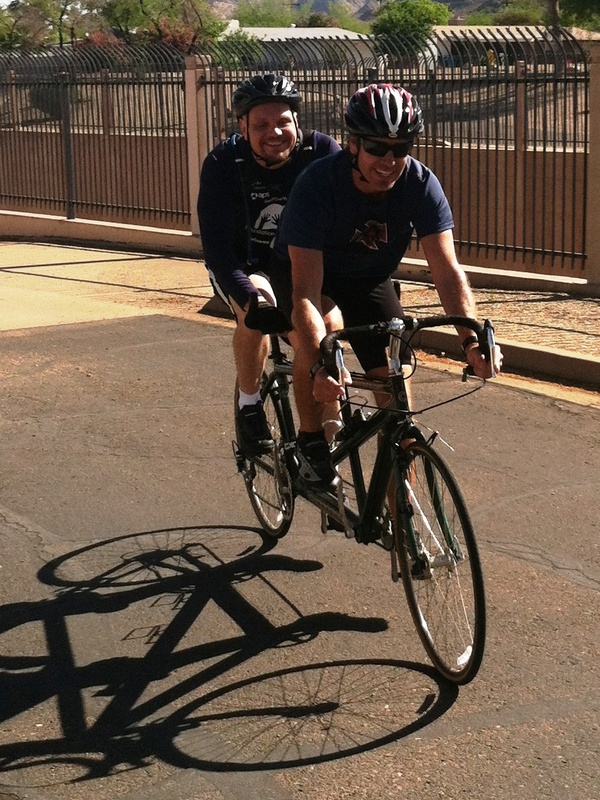 Doug was an incredible supporter and I truly appreciate his gift of the Cannondale Tandem that we used on the ride. Even through you weren’t able to enjoy the heat with us; you were with us in spirit. On our ride we were able to pound out 99.6 miles on day 1, 98.5 miles on day 2, 103 miles on day 3 and 76 miles on the final day. During our ride our average speeds ranged from a low of 17 mph to a high of 23 mph with a total average of 20 mph. It was a great experience and I highly recommend it to anybody, regardless of what your passion is I highly recommend of stepping out and making it happen. We had another successful journey today. We started our day with a news interview and an emergency stop for extra bike tubes. This delayed us from starting our ride until 10:30 am. I-8 was far smoother than I-10 however this did not stop us from getting a leak in the Van’s tire and a total blow out on the tandem’s back tire. This delayed us another 2 hours. In spite of these challenges we were able to finish our day at 103 miles at 6:30 pm. Although we are all pretty sore except for our support driver Ben (who keeps complaining about his right calf) we are looking forward to finishing up The Blind Ride tomorrow afternoon. Special thanks to America’s Choice Inn in Gila Bend for hooking us up with 3 rooms for the night. Had a lot of fun on the road today. We started off with an awesome 20 mile down hill because we climbed 100 miles to get to it the day before. We made it into Tucson by 9:15 am, but then we started having problems with flat tires. Apparently we have been picking up left over tire pieces from other vehicles in the form of steal threads from blown out truck tires. Fortunately we had already planned to go to The Ordinary Bike Shop where they fixed my tire and Gene’s cable for his front derailer. 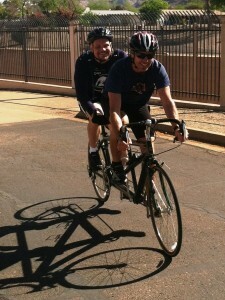 Then Steve from Channel 13 in Tucson interviewed Scoob and I about our ride for the news tonight. We worked our way through Tucson on several bike routes which worked out to be pretty fast since Steve from Channel 13 couldn’t keep up with us due to Tucson traffic and construction. We ended up connecting up with a Frontage road next to I-10 at Ina and were able to take the it through the rest of town. After about 30 miles on the Frontage road we connected up with Highway 84, then about 6 miles short of Casa Grande we ended up getting another flat on that same tire (a tire that is guaranteed not to go flat). 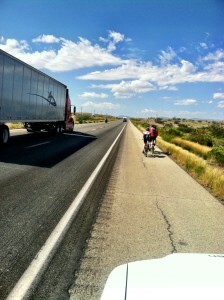 We finished our day in Casa Grande with a total of 98.57 total miles, with an average of about 20 miles per hour. This puts us approximately 40 miles ahead of schedule. We hope to finish on Friday night. We finished off our night with Dinner at La Parrillas with Gene’s uncle Dan. Dan’s wife Beverly was a student at the Foundation for Blind Children, this is how Gene first heard of the Blind Ride and became part of the team. Dan treated us to an awesome meal and regaled us with some awesome stories. This finished off an awesome day, and it looks like I may have a new sailing buddy. We had an awesome ride today. 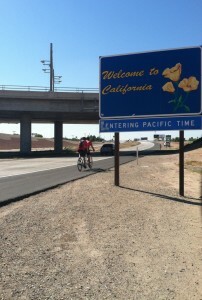 It was far more challenging than what we originally expected due to heavy headwinds. In all we made it 99.2 miles surpassing our original goal by 12 miles. We ran into a little bit of road construction but Scoob was able to maneuver us through the obstacles like a pro. Everyone is sore, even Ben’s right foot is a little tender. But we are looking forward to tearing it up tomorrow!! Channel 12 News recently interviewed Mike and Scoob and talked about the Blind Ride event to raise $25,000 for the Foundation for Blind Children. If you would like to make a donation to help this great charity you can click the donate button on the side of this page. It is hard to believe that I am only a few days away from my ride across Arizona. The event is called The Blind Ride and is a charity effort to help the Foundation for Blind Children a 501c3 charity in Phoenix. The Blind Ride should make for an incredible yet challenging five day adventure for all of us. 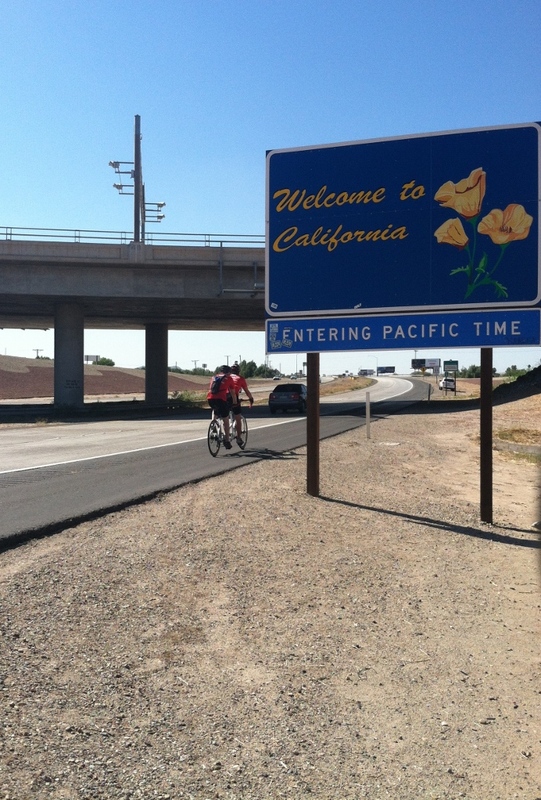 This tandem bike ride is 390 miles and starts at the New Mexico border and runs to the California state line. My goal is to raise funds and awareness for the FBC and hopefully inspire a few people along the way. 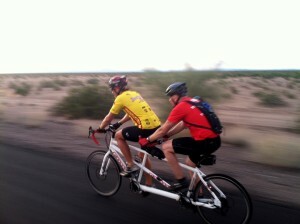 Riding a tandem bike as a blind man is exhilarating. My first few rides were a bit rocky, but still a lot of fun. Being on the back of a road bike feels like something between flying and riding a roller coaster. The feel of the road under you as the wind flows by heightens all of your senses. Going down hill at over forty miles an hour will keep you having some constant communication with God. I have no idea of what is coming or what the terrain has in store for us, but I hold on and lean in to the turns with the bike. This makes for a scary and exciting experience not to mention a great workout. You really have to have a lot of trust in the Captain. My training schedule has had Scoob Schmidt (Captain) and me riding 50 to 130 miles a week for the last 5 months. We have now ridden well over 1000 miles together and have found a solid balance and rhythm on the bike. My training for this event has been amazing and I am looking forward to seeing how it pays off. The Blind Ride starts on September 25 and we plan on finishing on September 29th. This 390 mile route will have us riding a minimum of 80 miles a day to reach our 5 day goal. There are 4 of us riding the route and 2 support vehicles following. We have 2 Cannondale tandems thanks to team member Doug Bowden. Doug, Scoob and Gene Longwell will also have their standard road bikes along to ride when not working as the Captain. Ben Cane and Doug’s daughter Kelly Bowden complete our 6 person team as drivers for the support vehicles. I started the Blind Ride as a fun way to help raise funds for the Foundation for Blind Children. Our hopes are that we will be able to raise $25,000 to help the FBC’s Braille program. If this sounds like something you would like to contribute to, thank you. To donate you can go to www.seeitourway.org… This is a truly worthy organization that made a huge impact in my life. Every little bit helps and will make a difference in a blind or visually impaired person’s life. I have found a new passion for riding. After competing in the 2010 Adventure Team Challenge (a Colorado adventure race), I have felt compelled to get involved in both road and mountain biking. To this end, in July of last year I bought my first tandem road bike. After a few minor mishaps I have developed a love for this amazing sport. On September 25, 2012 I am starting my first long distance ride. The event is called The Blind Ride and is a 390 mile bike-a-thon. The five day trip crosses Arizona starting at the I-10 highway and New Mexico border then finishes where Highway 8 meets the California border. This fundraising event is to benefit the Foundation for Blind Children’s Braille Program. At present my team for the Blind Ride consists of Ben Cane, Scoob Schmidt, Doug Bowden and myself. We are still working out some of the details for our support team. Ben has been on several of my previous endeavors including Kilimanjaro, the Grand Canyon and the Arizona Trail. Scoob is an avid mountain biker and competes in races throughout Arizona. Doug is a passionate Road Biker and participates in road biking events around the world.